Excavators provide exemplary digging ability for projects that smaller pieces of dirt equipment cannot handle. 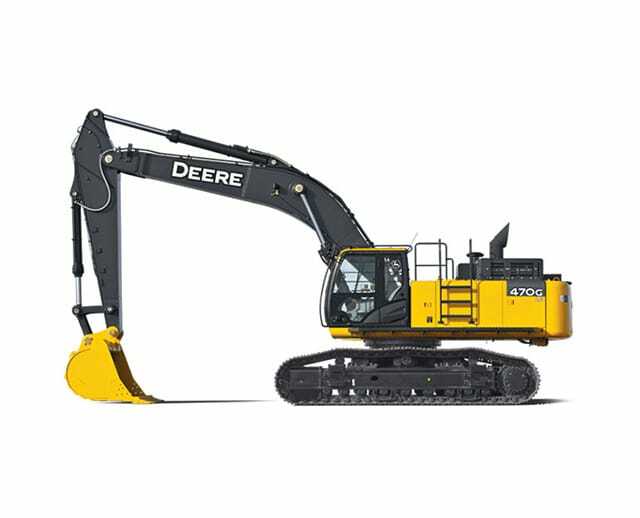 An excavator, also called a digger, is a piece of heavy construction equipment with a boom, a dipper or stick, and a bucket and cab on a rotating platform called the house. The arm is connected to an elbow that holds and controls the excavator bucket. The house sits on top of an undercarriage or frame with crawler tracks or wheels. Most models can rotate 360 degrees, and you can replace the excavator bucket with several different attachments. 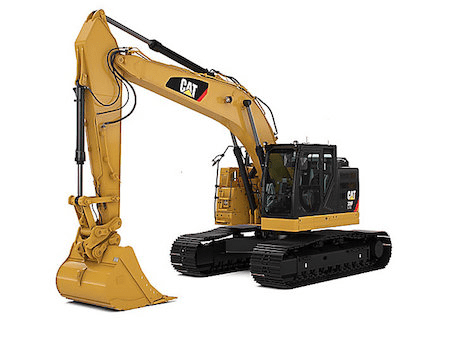 A hydraulic excavator uses hydraulic fluid, hydraulic cylinders, and hydraulic motors. Cable-operated excavators use winches and steel ropes to make the same movements. The smallest excavators can fit through a doorway, and the largest models can weigh more than 180,000 lbs. Excavators are often used for mining, material handling, landscaping, demolition, river dredging, and construction. The first predecessor to modern excavators was a steam shovel invented in 1796 by Peter Grimshaw of Boulton & Watt. For most of the 19th century and the early 20th century, cable excavators dominated earthmoving. Later, the hydraulic machines people often use today replaced them. The first mechanized steam shovel and mining excavator was the Otis steam shovel. It was invented by William S. Otis in England in 1835, and it was the first to use a mechanized boom and a single bucket to remove dry earth. It was a staple of the construction and mining industries until the late 19th century, and it was manufactured with updates until the 1930s. A model called the partial swing railroad shovel was mounted on rail tracks so that it couldn't rotate 360 degrees like most other models. In the 1920s, companies started producing machines powered by gas and oil instead of steam. They mounted them on wheels and crawler tracks rather than rails for better mobility. The last railroad shovel was shipped in 1931. In the same decade, the quarry and mining shovel were developed. The popular Bucyrus 120-B was designed in 1925, and it combined the strength of the railroad shovel with the 360-degree capability of the stripping shovel, which was often used for strip mining. Kilgore Machine Co. of Minneapolis, Minnesota, patented the first hydraulic shovel in 1897, after a British business, Sir W.G. Armstrong & Co. developed a similar model. John W. Page, a partner of Page & Schnable Contracting, invented the dragline excavator in 1904 to help dig the Chicago Canal. The Gradall excavator was invented by two brothers, Ray and Koop Ferwerda of Cleveland, Ohio. Launched in the early 1940s, the Gradall excavator was a hydraulic excavator with a telescoping boom for better reach. Long reach excavators are similar, but they don't have the telescoping feature. In 1948, another set of brothers, Carlo and Mario Bruneri, developed a wheeled excavator. They sold the patent and manufacturing rights six years later to a French company, Society of Industrial Construction of Mechanical Hydraulic Appliances, or SICAM. SICAM then built an excavator called the Yumbo in 1954. Three years earlier, another French company called Poclain produced its TU hydraulic excavator, which employed a hydraulic pump and cylinders. The TY45, the first fully revolving model, was introduced in 1960. There are many types and models of excavators available from a variety of manufacturers. Here are some of the most successful manufacturers and popular models. 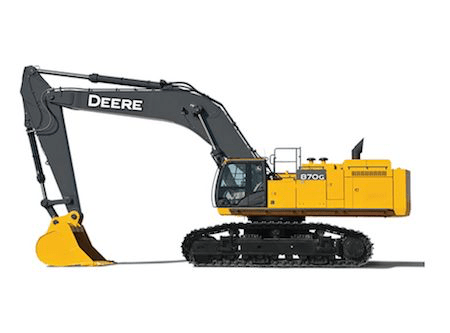 John Deere introduced its first excavator, the 690, in 1969. Today, you can choose from a wide range of equipment with spacious cabs and easy controls with lots of options. The 17D weighs 1.89 metric tons, has 11 power kW (14.8 hp), and an operating weight of 1893 kg (4,173 lbs) while the 870G LC weighs 87 metric tons, has an operating weight of 85,600 kg (188,716 lbs), and 382 power kW (512 hp). Seventeen models weigh 6 tons or more. The new 190G W and 230G W wheeled excavators are both very maneuverable, and they have certified Tier 4 Interim Isuzu engines with 159-horsepower certified. The engines are connected to the John Deere Powerwise III hydraulic engine management system. You can choose from three settings. High Productivity offers more engine power kw and a faster hydraulic response for moving large amounts of materials. Power mode is best for normal operation, and Economy mode saves fuel by reducing the top speed. Operators can also press the Power Dig button for additional hydraulic power. Contractors can choose from a variety of boom, outrigger, blade, and bucket options as well. Caterpillar Inc., often called Cat, was founded in 1925. Today, it's one of the largest heavy equipment manufacturing companies in the world. In 1972, the company introduced the 200 Series of excavators. The latest developments include hybrid engines to increase efficiency without sacrificing productivity. The 336E H is one of the newest hybrids. You can also try the 36-ton 336F XE hybrid (Operating Weight range 36100 – 40300 kg.) The new 335F LCR (Operating Weight 84170.0 lbs) have a lower turning radius and lower fuel consumption rates than the previous 328D LCR. It also has better lift capacity, more space for the driver, and ambient cooling capabilities. 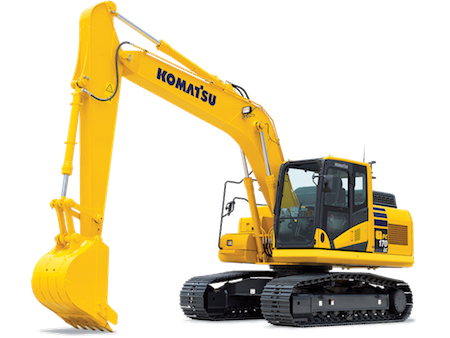 Komatsu was founded in Japan in 1921, and it entered the American hydraulic excavator market in the late 1960s with the H-Series. Today, Komatsu hydraulic excavators are popular all over the world over for their advanced technology. The latest Komatsu excavators offer advanced electronic controls, easy maintenance and troubleshooting, and better comfort. New engine and hydraulic technology have led to increased fuel savings, which can be monitored through KOMTRAX, Komatsu's machine monitoring system. It also gives operators information about general excavator performance. Most models have rear-view monitoring systems for better visibility and safety. They also have a Closed Center Load Sensing (CLSS) hydraulic system for better efficiency and response time. Many models have a quick arm return circuit for faster cycle times and better fuel efficiency. The HB215LC-1 hybrid (Operating Weight 48,175 lbs / 21,850 kg) uses an ultra-capacitor to capture excess energy during swing deceleration. Then, it uses the energy to power the swing and supports other functions. The PC210LCi-10 is Komatsu's first Machine Control excavator. It has unique guidance technologies, including a function that lets supervisors limit digging below grade to minimize over-excavation and make finish grading more accurate. There's also an inertial measurement unit and stroke sensing cylinders for real-time bucket edge positioning. A large customizable touchscreen can show three views at once, including 3-D views. Volvo Construction Equipment has been growing since 1832. It offers crawler excavators, wheeled excavators, short swing excavators, and mini/compact excavators. 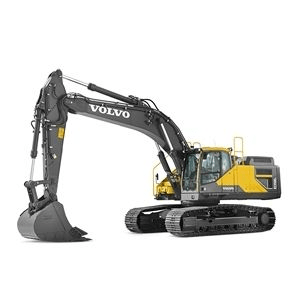 The new Volvo EC350E excavator (Operating Weight 78,940 – 92,760 lbs) is reliable, powerful, and efficient. The hydraulics are controlled by an advanced system to produce power on demand. Idle, Fine, General, or Heavy work modes are available. 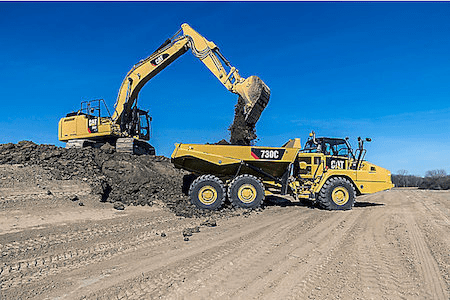 When the controls have been inactive for a set amount of time, operators can program the excavator to reduce engine speed or shut down to reduce fuel consumption and noise. An 8-inch color LCD screen displays essential information. Earthmoving projects can be finished more quickly and efficiently when you use the right tools and equipment. 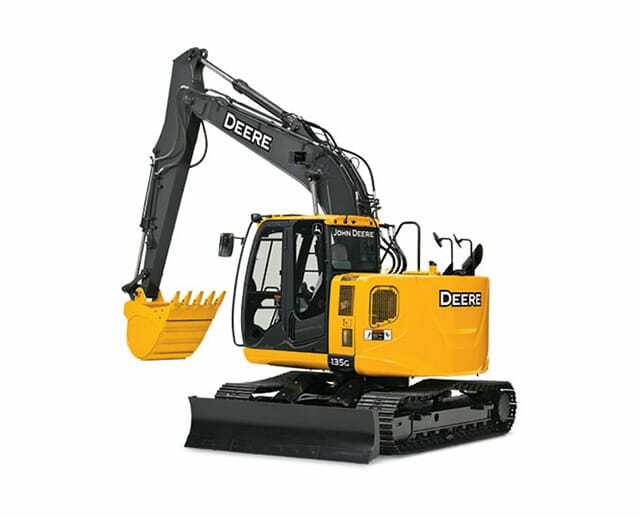 Excavators are often used for material handling, demolition, landscaping, creating trenches for drainage, renovations, road construction, installing a pool, digging up sewage systems, digging pipes for a geothermal HVAC system, mining, lifting heavy machinery, and river dredging. They come in many sizes and types, so they're practical for backyard use as well as large-scale construction. Excavators are usually specified by dig depth, arm force, dump height, maximum height, and engine power rating. Many attachments are available, including breakers, grapples, augers, and several types of buckets. Excavators with thumbs or thumb attachments can grab and move sections of pipe and other heavy objects. Skid steer excavators have booms and buckets that face away from drivers. They can reach over the cab instead of reaching around. This makes them especially useful in areas without lots of space. They can also turn 360 degrees without moving forward or backward. The wheels on the right and left sides can operate independently. Many professionals use them for digging pools, backfilling, site cleaning, rubbish removal, and residential work. A suction or vacuum excavator produces powerful suction through a pipe that's up to a foot wide. The air in the suction inlet can travel up to 220 mph. The suction nozzle usually has two handles for the operator. The handles are on a collar that can rotate to uncover suction-release openings with grilles over them. Opening the grilles releases the suction, making the nozzle drop anything it picks up that's too big to go through the tube. The end of the tube or pipe is often serrated for cutting earth easily. The soil is often loosened first with a powerful water jet. A suction excavator is the best choice for finding underground utilities without causing expensive damage. A dragline excavator is a crane with a long boom. An excavator bucket is attached to the boom with a wire cable. It's often used for digging trenches, strip mining, and dredging ponds. When someone is injured on the job, the effects go far beyond the harm to the worker. It can also be expensive and inconvenient for employers and employees. Workers' compensation insurance payments that are required by law will rise, and you'll have to assign extra work to your remaining employees or train a temporary or permanent replacement. While workers' compensation can reduce lost income for the injured employee while he or she recovers, it won't cover all of his or her living expenses and medical bills. You could have to defend yourself from a lawsuit or pay a large settlement. While excavators allow for efficient digging and transport of soil and rubble, it takes significant training and experience to operate one correctly. Consistent, thorough safety protocols are essential for preventing accidents and keeping your expenses low. OSHA, the Occupational Safety and Health Administration, regulates excavator safety procedures. Only operate the excavator if you're sitting in the seat and have full control. Reduce your speed when working on rough terrain in congested areas. Don't try to carry loads that exceed an excavator's operating weight capacity. Place soil and debris as far away from the excavator and the work site as possible. Never dig underneath an excavator. Don't dig underneath sidewalks or other structures without a support system to prevent a dangerous collapse. When loading trucks, don't swing the bucket over the cab of a vehicle. Don't try to clean the bucket by striking it on the ground or another object. Wear a helmet and ear and respiratory protection when needed. In very steep or slippery conditions, you can use the boom and arm to help you move to or from your job site. When using an excavator for digging a trench, place dirt beneath the tracked excavator to make it level. This will help you keep the trench vertical and avoid cave-ins. If you're working on a very steep slope, dig a shelf where the excavator can sit without sliding down and causing an accident. Keep objects and people other than the operator away from the excavator. In regions with moist soil or lots of rain, you may need water removal equipment as well. Have an expert inspect areas that are subject to runoff or erosion daily and make sure any walkways over excavation sites have guardrails. Even when you rent an excavator for a temporary job, you need to make sure your employees are correctly trained and are familiar with relevant regulations. If you have any questions, be sure to read the instruction manual and talk to one of the helpful experts at BigRentz. You should know the excavator operating weight, lifting ability, and safety features of the model you choose. All operators should have driver's licenses, and most employers require at least a high school diploma. Some states require excavator operators to have commercial driver's licenses or CDLs, as well. In every state, anyone transporting an excavator with a commercial truck must have a CDL. Some employers will require an additional written or practical test to make sure workers understand company rules. If a business doesn't provide in-depth training, operators should take a training course. Most excavator training courses only last for a few weeks, and they can give workers essential experience. Employers should make sure workers are trained on the type of excavator and attachment they'll be using, not just excavators in general. Many colleges and employers use apprenticeship programs to let students get more hands-on experience. Many apprenticeships last for two or three years, and some programs run by employers guarantee jobs for people who complete the course. How Do I Rent an Excavator? | Visit BigRentz's website to rent an excavator for your company's next project. BigRentz has more than 8,000 locations in the United States, so it's easy to find the equipment you need near you. Delivery and pickup are available for a small fee, and maintenance is free whenever you need it. BigRentz can also help you make sure that your employees can operate the excavator you choose safely. How Long Can I Rent an Excavator? | BigRentz offers rentals from just a day to more than a month long. One day is the same as one 8-hour shift over a 24-hour period. One week is five 8-hour shifts over seven days, and a month is 20 8-hour shifts over 28 days. Renting for a longer amount of time is often a better value. What Makes Renting a Better Choice Than Buying? | Renting is much more flexible than buying equipment. You can get the tools you need in just a day or two instead of spending weeks to research the best purchase. Renting won't impact your company's credit rating as much as buying an expensive item as a forklift would, and you won't have to pay for storage while you're not using the equipment. That way, you can use that available credit for other investments. If you're thinking of buying an excavator, you can rent a similar or identical model to test it under working conditions before you invest in your equipment. What's the Cost of Renting vs. Buying? 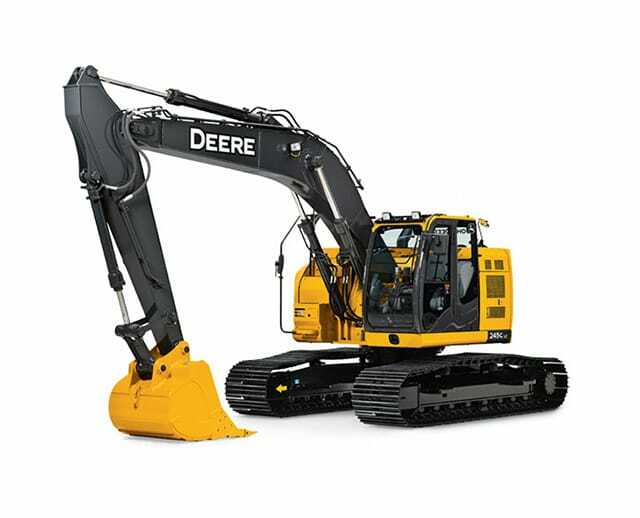 | When you rent an excavator, you won't have to pay for maintenance, storage, or most repairs. You also won't lose money when your equipment depreciates, and you won't have to hire a separate driver for pickup and delivery to your job site. BigRentz will take care of all the details involved with transporting large equipment. What Is Local Delivery? | If your job site is in BigRentz's local delivery range, you'll only need to pay a flat delivery fee. However, you could have to pay an extra mileage fee if your job site is outside that range, usually about 25 to 50 miles from the nearest BigRentz location. How Long Does Delivery Take? | Most of the time, you can get the equipment you need in just a day. However, early-morning delivery times often fill up quickly. You should request the equipment you need as soon as possible to avoid delays. Is Fuel Included? | All equipment is delivered with a full tank or a full battery charge, including excavators. You should refill the tank before your rental expires to avoid additional fuel charges. Do I Have to Call When I'm Done With the Equipment? | You won't have to call for equipment pickup, but you can call if you need an extension on your rental or if you have any questions. Contact BigRentz at least four hours before your rental expires for an extension. Is Insurance Required? | Insurance is a good idea, but it's not required before you rent most types of equipment. However, it's needed for excavators because of their cost and size. Contractors equipment insurance covers the equipment you own and rent, as well as small tools and equipment owned by employees. It also protects you from liability for damage or injuries. For example, your insurance will cover repair expenses if an excavator causes cracks in the pavement or collides with another piece of equipment. It will also pay for cleanup and debris removal after an accident. How Much Insurance Is Recommended? 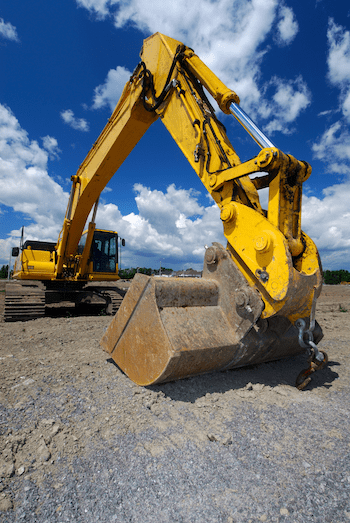 | Depending on the size and type of excavator you choose, you'll need from at least $150,000 to $675,000 in contractor's equipment insurance. You'll probably need more to cover the equipment you own, smaller tools, and employees' equipment, including the personal vehicles they use to travel to the job site. Jobs for excavator operators are expected to increase in the next ten years because these pieces of equipment are powerful, versatile, and easy to operate. Contractors use excavators to dig holes for septic and sewer systems, swimming pools, canals, and more. An excavator can also give the land that's too steep a flatter grade for more stable construction or help with demolition. Call BigRentz for an excavator or any other type of construction equipment you need, as well as expert help choosing the best excavators for your business and learning how to operate them safely.